The Wizards went ice-cold from the field, shooting just 37 percent from the field as they lost to the lowly Hornets, 98-93. John Wall and Bradley Bealonly combined for 37 points, shooting 11-30 from the field. Five Hornets players scored in double figures led by Cody Zeller with 19 as the Hornets won an ugly game in Charlotte. From the start of this one, it looked like we might be in for another up and down affair. Bradley Beal and John Wall started the game by driving down the lane for open dunks while Charlotte was knocking down shots on the other end. Things slowed down midway through the quarter after Beal was sent to the bench with two fouls. Both teams would combine for just nine points the rest of the quarter as the Wizards took a 20-19 lead after one quarter. The second quarter wasn’t much prettier. Things looked promising for Washington as Ian Mahinmi was able to score around the rim or get to the free-throw line. Brandon Jennings, who’s struggled to score, hit a circus shot with the shot clock winding down as the Wizards took a 29-21 lead. But Kemba Walker would come to life knocking down two three-pointers on back-to-back possessions to help the Hornets take a 35-34 lead. 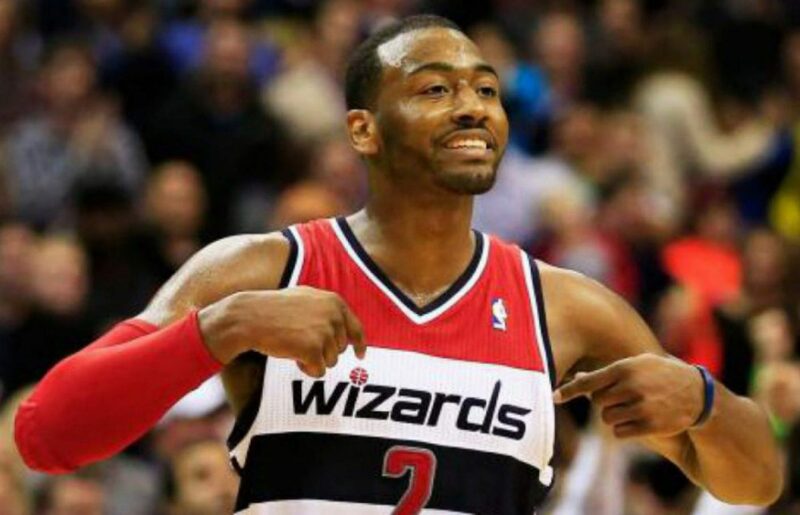 John Wall came through with the highlight of the night on the next possession, as he pinned a Walker layup against the backboard on a fast break that the Wizards converted into a three-pointer on the other end. The Wizards only shot 32 percent in the first half but led, 40-39 at halftime. The third quarter wasn’t a whole lot better for the Wizards. Washington started the quarter just 4-11 from the field as Charlotte jumped out to an eight point lead. But in a game like this one, an eight point deficit felt more like a 20 point deficit. Thankfully, Bojan Bogdanovic, who was quiet for most of the first half, scored the final four points for the Wizards as they were able to trim the lead to 3, 64-61 by the end of the third quarter. Frank Kaminsky picked a good time to get hot. After missing his first nine shots of the game, Kaminsky connected on four of his five shots in the fourth quarter to help the Hornets take a nine point lead midway through the fourth quarter. Otto Porter responded with timely shots to give Washington a chance late, but Bradley Beal’s step back three to tie the game with nine seconds left came up short. With the loss, the Wizards are two games behind the Celtics as they prepare to meet on Monday night in Boston. They still hold a two game lead over the Raptors for the third seed. For those of you who like offense, the first half of this game was not for you. Chalk it up to a combination of good defense from both squads and missed wide-open chances. Neither team was particularly effective from three-point range either as the Wizards shot just 25 percent from downtown and the Hornets shot 31 percent. This was one of John Wall’s worst defensive games this season. Wall looked tired and uninterested in playing defense tonight against a small and speedy Kemba Walker. As a result, Wall would go over every screen and try his patented wrap around steal from behind. It worked the first time but that was it. Wall tried it again when playing defense in the post and once again, it didn’t work. Not only did it not work, the defense was left scrambling to rotate and find their man and it resulted in easy baskets for the Hornets on multiple occasions. Last night, Robin Lopez had a career night. Tonight, it was Cody Zeller’s turn to stuff the stat sheet. Zeller ended the night with 19 points and 5 rebounds as he dominated both Gortat and Mahinmi. Zeller got going early with dunks around the rim and was a force to be reckoned with on the defensive end with four steals and two blocks. As we know, Gortat is in the midst of a slump and the Wizards are still looking to get Mahinmi into midseason form, but for now, the center position is a hole in the Wizards defense.